By the slimmest of margins, Alabama is still No. 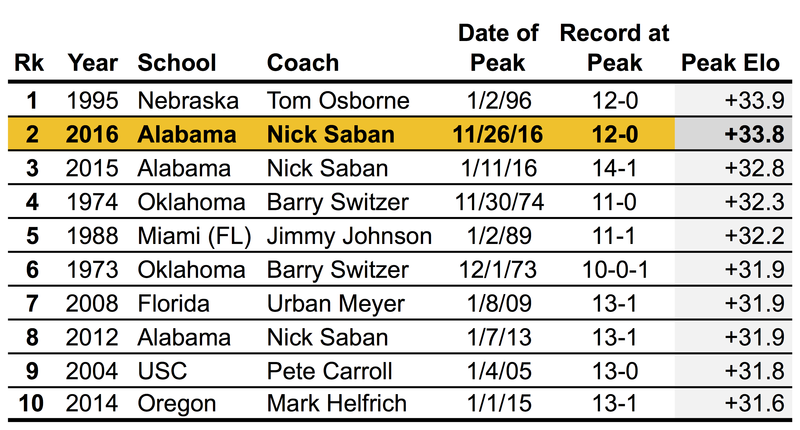 2 all-time behind Nebraska. But if the Crimson Tide wins the SEC championship by at least 11 points, it would also break the record for the highest peak Elo rating of any team since 1936. Elo says ‘Bama should be favored by 23 points at the Georgia Dome’s neutral field, and the consensus of the betting lines favors the Tide by 24.5, so it’s probably more likely to happen than not.2 But if not — say, Alabama only beats Florida by a touchdown instead — the Tide would need to win their first game of the College Football Playoff (most likely against Washington, if our CFP model holds up) by any margin in order to break the record. After that, there’s just the little matter of finishing out the season with another win to keep pace with Osborne’s Cornhuskers, who peaked at the end of the season with a national title. CORRECTION (Nov. 28, 5:26 p.m.): A previous version of this article misstated Nebraska’s 1995 football ranking. They were the sole champions, ranking No. 1 according to both the AP and Coaches’ polls; they did not share in the national title. So, going back to 1936. It’s worth noting, of course, that teams always gain Elo after winning, even if they win by less than would have been expected going into the game. So Alabama will keep picking up rating points as long as it keeps winning.